When you’re so successful as a sophomore that you’re named the conference Libero of the Year, you’ll be the one and only starter right? Not when an ultra-talented libero freshman shows her stuff. 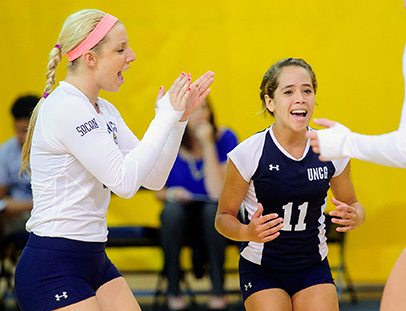 Meet the SoCon’s leading libero tandem – Kellie Orewiler and Katherine Santiago. In one set, Santiago might wear the special libero jersey. In the next, Orewiler may. Whoever is wearing it, they’re often on the court together, side by side – defending the back row against kills. This year’s season begins a new chapter. The team features several new players. Next year’s strong class of recruits was announced last month. Preseason features in YahooSports and on ESPN.com created buzz. The team was picked to finish first in the North Division, with Davidson finishing first in the South. Before the season started, Miller spoke of the vision he and the team have. Big dreams. The libero is the defensive leader on the floor, specializing in digs, where you get low or dive to pop the ball back in the air. The matches often attract loud crowds. At the Oct. 6 match versus Chattanooga, Fleming Gym was filled with more than 600 fans; one tweet called it an “amazing crowd, electric atmosphere.” With the win, the Spartans moved to 4 wins, 2 losses in the SoCon. Orewiler had 33 digs. As they headed to the locker room, each of the two liberos’ total number of digs for the year stood perfectly equal at 281. “They’re totally two different personalities. Kat is very quiet, a silent threat,” says co-captain Olivia Humphries, who leads the team in points. “Kellie is more vocal. You want to be a great team, you’ve got to take care of business. Every point of every set. “I’m 4’ 10’’ and 1/2”” Santiago says. The freshman’s major will be biology. “I am very interested in being a pharmacist,” she says. Orewiler, named SoCon Libero of the Year at the end of last season, is a business studies major. “I am looking into entrepreneurship – I’d like to own my own business someday.” And she is a Spanish minor who hopes to study abroad. It’s kind of “love/competition/friendship” the freshman says of her fellow libero. The crowds are loving the play – particularly the UNCG baseball players. They started a cheer whenever Santiago serves: “Kaaaah … BOOM!” Now, others in the crowd join in. “It’s kind of funny, but I just have to focus on the game,” Santiago says. Orewiler, a co-captain with Humphries and Ari Lysacek, picks up on the focus theme. There are high expectations. Their success depends on what they do in practice each day and the atmosphere they create there. See the schedule of upcoming games. All home volleyball matches are free admission.